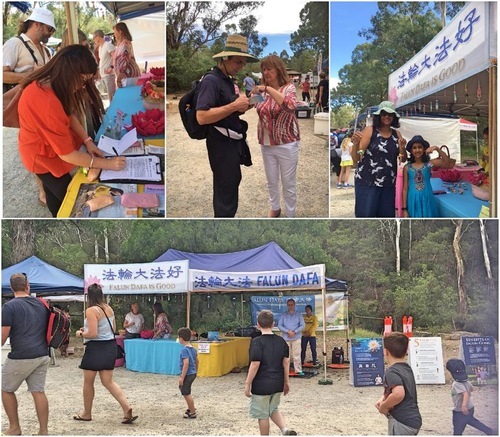 Falun Dafa practitioners recently participated in three community festivals in Melbourne, the second most populous city in Australia. Melbourne holds many festivals in March as the weather starts to cool down with the arrival of autumn. These events included a festival hosted by the Knox City Council on March 2 and 3, 2019, Global Fiesta at Box Hill Gardens on March 17, and the Warrandyte Festival hosted by the Manningham City Council on March 23 and 24. 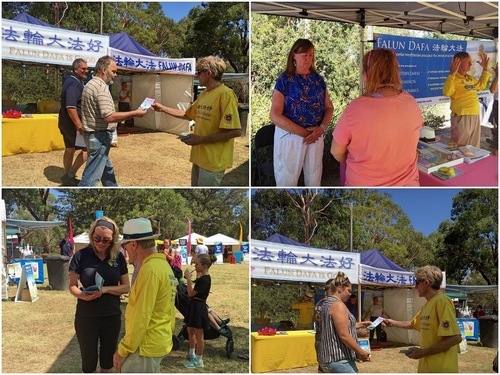 Martin Nilsen, who works for the Australian government, said he had heard about Falun Dafa at a local event several months ago. He considered the suppression of Falun Dafa, especially the forced organ harvesting from living practitioners, unacceptable and barbaric. He said the fact that China’s doctors would kill someone to get a body part to sell was appalling. “I am not a religious person, but that is terrible,” he said. Nilsen hoped governments could pass laws to ban organ transplant tourism. He praised practitioners’ efforts to raise awareness of the brutality and believed the persecution would come to an end someday. With the degenerated moral values in society, Nilsen found the principles of Truthfulness-Compassion-Forbearance appealing because they guide you to become better people. He said practitioners should come to more events like this to promote these values. Global Fiesta at Box Hill Gardens. are consistent with traditional values and everyone would benefit from them. Effendy, a project manager from a financial company, has lived in Melbourne for 21 years. He accepted some materials from a practitioner and signed the petition to help stop the persecution in China. “I think what the Chinese Communist Party did is horrible. It is unbelievable that organ harvesting is happening. I consider it a genocide,” he said. The Australian Senate published an inquiry report and provided 12 recommendations on how to stop overseas organ trafficking. Effendy applauded the progress and thinks that this was a good initiative. “We should definitely make it happen,” he said. He expects the Australian government to do more. “This is related to basic human values and everyone is involved,” he said. 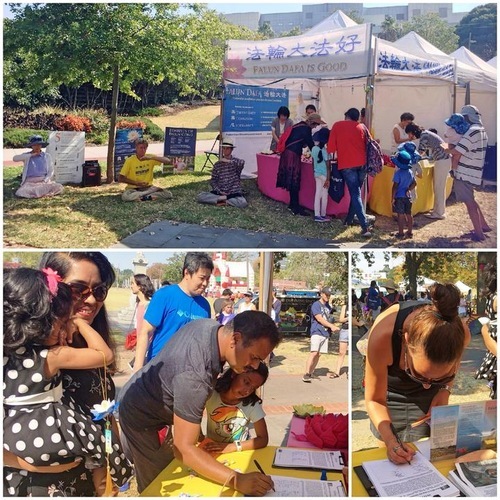 People sign a petition to stop the forced organ harvesting in China at the Warrandyte Festival. Keana, who works in sales at Knox, talked with a practitioner named Barbara about the practice of Falun Dafa. Impressed by the principles of Truthfulness-Compassion-Forbearance, she believes adhering to them would bring a peaceful and positive life to practitioners. Barbara had an accident in 2002. She was working on a 7-meter-high (23′) wooden scaffold, when she lost her footing and fell to the ground. In addition, her knees and hands were also smashed, her teeth were dislodged, and she experienced blurred vision. While in the hospital, she began to practice Falun Dafa upon the recommendation of friends. She recovered quickly, and her previous illnesses also disappeared.